This is a spectacular butterfly for New England. It is large (wingspread 4-5”) and graceful, with a range more centered in Florida and the tropics than here. But it has occasionally delighted us with its presence, even establishing temporary breeding colonies. In the years 2010 through 2013, it became a resident species once again. A prolonged incursion of the Giant Swallowtail into the northeast took place in the 1870’s and 1880’s, amply chronicled by Scudder and other nineteenth century entomologists. In 1874 it was found in Rye, New York, where it survived for several years, and then it was noticed and captured in New Haven, Connecticut in 1875. Later in the 1870’s, it was common in the vicinity of Berlin, Connecticut. In the 1880’s it persisted for several years in some upstate New York locations, and even in the Montreal area (Scudder 1889: 1340). In the early 20th century, it was reported regularly in Connecticut (O’Donnell et al., 2007; 3 specimens in Yale Peabody Museum from the 1940’s). Scudder says that Massachusetts was “invaded” both by way of the Connecticut River valley and the sea-coast. The first reports are from both Amherst and the Boston area in July 1882. Then, five specimens were captured in August 1883 at Worcester, and other specimens were found in Sharon, Cambridge and Newton. (A Cambridge specimen from Aug. 9, 1883, G. Dimmock, is at Boston University.) Also in 1883, larvae were found on prickly ash trees in the Harvard Botanic Gardens in Cambridge. Forbes (1909) reports another Amherst specimen taken sometime between 1900 and 1909. And Shelley W. Denton, famed collector based in Wellesley, Massachusetts reported that “On June 2, 1895, while butterfly hunting in Wellesley, I saw and nearly captured a fine specimen of Papilio cresphontes. This is the first I remember to have seen flying in Wellesley, although Mr. Thomas Smith at the Hunnewell gardens has one taken by him a few years ago on those grounds (Denton 1895)." Despite the early excitement, Giant Swallowtail was almost gone from Massachusetts by the 1930’s. Farquhar (1934) characterized it as “extremely rare.” It also became rare in nearby states: there were none found during the 1995-99 Connecticut Atlas project, though it was found again in 2010 in the Canaan area. And it was thought of as “Historical” in Rhode Island until sight records emerged in 1983, 1984, 1985 and 2010 (H. Pavulaan; M. Arey, LSSS 2010). Northern Prickly Ash (Zanthoxylum americanum) is the main wild host plant in Massachusetts. This plant is fairly common in the Salisbury and Canaan areas of extreme northwest Connecticut, as well as just to the north at Bartholomew’s Cobble in Sheffield, Massachusetts, where the Giant Swallowtail was found in numbers in 2010. Northern Prickly Ash is native to most counties in Massachusetts except Bristol, Plymouth, Barnstable, Dukes and Nantucket on the southeast coastal plain, but it is not widespread today (McGee and Ahles 1999; Sorrie and Somers 1999). It is a 4-10’ locust-like shrub which grows in old fields, in the understory and edges of fertile woods, on riverbanks and in disturbed areas, sometimes forming large thickets. Giant Swallowtail also lays eggs on two non-native garden plants, garden rue (Ruta graveolens) and the closely related Gas Plant or Dittany (Dictamnus albus). It also uses the native Wafer Ash or Hop Tree (Ptelea trifoliata), which is introduced into Massachusetts from further west (Sorrie and Somers 1999; Gleason and Cronquist 1991; Scott 1986); Ptelea is found in all but the southeastern counties (McGee and Ahles 1999). This small shrub or tree is present in Topsfield in Essex County at the MAS Ipswich River wildlife sanctuary, where a small colony of Giant Swallowtail has been found. In addition to its larval hosts, Giant Swallowtail adults use many floral energy sources; in Massachusetts it has been seen nectaring on wild bergamot, thistle, buddleia, and common milkweed. It is also fond of puddling in dirt roads. In addition to garden rue and gas plant, Giant Swallowtail has adopted cultivated non-native Citrus (e.g. oranges) as a host plant, and is therefore listed on Table 3 as among the “Switchers." In southern states, one of Giant Swallowtail’s main habitats is citrus groves. In northern states it is found in semi-open areas, including gardens. During 1986-90, this species was not recorded at all by the Atlas project. There is only one report from these years, a sighting by A. Grkovich in Saugus July 22, 1990 (LSSS 1990). There are no other Massachusetts reports in Lepidopterists’ Society records from prior years back to 1968. There are no reports in MBC records, which begin in 1991, until the report of a single in 1999, shown below on Chart 112. Between the years 2000 and 2007, MBC records show only 1 report of Giant Swallowtail. By this measure, this species was obviously Very Rare in the state (Table 5). In the 15 years shown on the chart, there were single sightings in 1999 ((7/17/1999, Sheffield, S. Berkshire NABA Count) and in 2003 (9/5/2003, Amherst, R. and D. Minear), both in western Massachusetts. In 2009 there were TWO reports, one from western Massachusetts and one from the east (8/15/2009, Sheffield Bartholomew's Cobble, B. Roberts, photo; and 9/3/2009 Topsfield Ipswich River WS, S. Borichevsky http://shootingmyuniverse.blogspot.com/2009/09/giant-swallowtail-butterfly.html) (this second report not yet shown on chart). 2009 was the first year this species had been reported in eastern Massachusetts since 1990. The two 2009 reports foreshadowed the explosion to come. In 2010, a total of 7 were reported. The western Massachusetts sightings were from Sheffield (3), Northampton (1) and Whately (1); the eastern reports were from Topsfield Ipswich River WS, 8/17/2010, 1, R. Wolniewicz, and Brookline, 8/31/2010, 1, B. Cassie. The eastern Massachusetts occurrences were too far away and too fresh to be migrants from western Massachusetts; several commentators that year and the next agreed that there must have been an influx up the eastern coast, in addition to the population in the Sheffield area in the southwest. The following year, 2011, saw "The Great Giant Invasion." It began with an influx, or more probably a local over-wintered population, of about 24 about June 23 in Sheffield at Bartholomew's Cobble in the extreme southwest corner of the state. Many of these were migrating northward. A second brood at the Cobble began emerging toward the end of July, with a peak count of 21 in "mint condition" on 8/2/2011 by F. Model (see photo above). Other photos showing puddling behavior and nectaring are available at http://www.pbase.com/bo_z/giant_swallowtail_series , http://brucedegraaf.zenfolio.com/p174937038 , and http://www.flickr.com/photo/fsmodel . There followed many, many reports of singles in numerous towns throughout the state in July and August, as the Giants dispersed northward and eastward from the Sheffield area. In August/September caterpillars were reported from at least five locations: Whately (B. Benner); Ludlow (A. Brown); Northampton Smith College (J. Rankin); Ashburnham (A. Archangelo); and Sheffield Bartholomew's Cobble (B. Cassie). In early August 2011, two Giant Swallowtails were again seen in eastern Massachusetts, at Ipswich River Wildlife Sanctuary nectaring on buddleia (R. Wolniewicz), one in pristine condition, suggesting local origin. Other reports from eastern Massachusetts followed -- from Rockport (Gable, photo), Andover (Godefroi), Billerica (Guidetti), and Sharon (fide Champagne). It seems likely that these either arrived from the south (e.g. Rhode Island rather than western Massachusetts), or were dispersals from a core breeding area at Ipswich River WS in Topsfield. Sightings in 2012 followed much the same timing and pattern, but were even more numerous (Chart 112). The May brood at Sheffield was recorded as "fresh, and undoubtedly over-wintered" (M. Arey, 5/12/2012). The second brood appeared about 7/13/2012 and then dispersed throughout western and central Massachusetts. It was not clear whether over-wintering succeeded at Topsfield in the east, but summer sightings throughout eastern Massachusetts increased dramatically in 2012. There were July-August reports from Topsfield, Chelmsford, Danvers, Wenham, North Andover, Marblehead, Newbury, Newburyport, Salem, Gloucester, Ipswich, and Haverhill in Essex County north of Boston, as well as from Arlington, Boston, Concord, Lexington, Waltham, Franklin, Lincoln, Wellesley, Foxboro, Medfield, Westwood, Norfolk, and Westport/south Dartmouth south of Boston, and even Wellfleet and Falmouth on the Cape and West Tisbury on Martha's Vineyard. The “invasion” continued in 2013 (Chart 112). The May flight was first noticed in the Sheffield area on 5/18/2013, again suggesting over-wintering. An early arrival in Paxton (6/1/2013, E. Barry; with eggs on gas plant found 6/4/2013), near Worcester in central Massachusetts, as well as a 6/2/2013 sighting in Chelmsford, suggested either migration into Massachusetts from inland Rhode Island or a local overwintering. The July brood at Sheffield was first reported on July 24 (R. Wendell, fide T. Gagnon); thereafter sightings occurred virtually throughout the Berkshires and the Connecticut River valley. No May flight at Topsfield was observed, but July-August sightings in northeastern Massachusetts included Topsfield Ipswich River WS, Wenham, Nahant, Newbury, Reading, Andover, and Saugus. Central Massachusetts sightings were particularly numerous, occurring in Athol, Groton, Hubbardston, Lancaster, Littleton, Phillipston and Spencer. Metrowest sightings included Acton, Cambridge, Hingham and Lincoln, and to the south were sightings in Mattapoisett, Dartmouth Allens Pond, Sandwich, Truro and Edgartown. Between 2010 and 2013, Giant Swallowtail or its eggs and larvae were seen in 95 of the 351 towns in Massachusetts, well-distributed throughout the state. The most Giant Swallowtails were seen in western Massachusetts and the Connecticut River valley; the next most common area was Essex County. But sightings have occurred virtually everywhere, reaching Cape Cod and the Islands in 2012 and 2013. Most sightings are of individuals. The only site where Giant Swallowtail has been seen in numbers is Bartholomew’s Cobble, a Trustees of Reservations property in Sheffield, in the southwestern corner of the state. A second site is in the east at Ipswich River, a Massachusetts Audubon Society sanctuary in Topsfield. Here a high count of 6 was reported on 8/12/2012 by M. Arey. Collectors please note that no collecting of insect specimens is allowed on either Trustees of Reservations or Massachusetts Audubon Society properties unless a permit is granted by the organization. Regionally, Sheffield is not far from a known and probably resident population in northwest Connecticut in the Canaan area. In the 1980’s, C. Maier and D. Schweitzer found caterpillars on separate occasions on Northern Prickly Ash in Robbins Swamp in Canaan (O’Donnell et al., CT Atlas 2007). Twenty-some years later, in 2010, there were July and August sightings of larvae and two to three adults in the Canaan area ( http://mailman.yale.edu/pipermail/ctleps-l/2010-August/002764.html ), and then in August 2011 five were seen in that area (P. DeGennaro 7/18/2010, ctleps-l; G. Hanisek 8/1/2011, ctleps-l). It is not certain whether these finds represent a new colonization or a continuation of the 1980’s population, but as in Sheffield, successful over-wintering seems likely to have taken place in 2010-11, if not earlier. The host plant, Northern Prickly Ash, is said to be fairly common in the Canaan and Salisbury areas (M. Nelson, masslep 8/1/2011). Giant Swallowtail has at least two generations in Massachusetts. There is potential for a partial third brood, since that has occurred in nearby regions, for example Ohio (Iftner et al. 1992). At least one second-brood caterpillar raised inside has emerged in September (B. Benner, 9/2/2012), but so far there are no other Massachusetts reports of very fresh individuals flying in September. During the years 2011 through 2013, the first generation of adults emerged (or arrived) in May or June. The earliest sighting dates are 5/12/2012 (Sheffield and Great Barrington, M. Arey); 5/18/2013 (Sheffield and Great Barrington, M. Arey and A. Grkovich); and 6/23/2011 (Sheffield, R. Wendell, Jr.) In 2013, the first eclosures of chrysalis’ over-wintered in a basement began 5/24/2013 (Whately, B. Benner). The second brood in these years emerged in July. The first July sightings in each year were at Sheffield Bartholomew’s Cobble: July 27, 2013 (R. Wendell Jr. fide T. Gagnon), 7/13/2012 (B. Benner); and 7/27/2011 (R. Wendell Jr. fide T. Gagnon). This generation appears to have dispersed widely, perhaps even across the state; the majority of sightings of adults in the state are in August. The latest sighting dates in each year are 8/30/2011 (Wilbraham, B. Klassanos), 9/4/2012 (Richmond, H. Caine); and 9/14/2013 (Athol, D. Small). Most eggs and larvae found throughout the state have been in July, August or September (except for the June 4 first brood eggs in Paxton mentioned above). For example, in 2011 mating by second-generation adults was seen on July 30 at Bartholomew’s Cobble (R. Laubach), and larvae were found on 8/12/2011 (B. Cassie). Also in 2011 larvae were found in the yard of A. Brown in Ludlow on 9/6, in Whately in the garden of B. Benner on 8/26, in the gardens at Smith College, Northampton, on 9/14, and on garden rue in Ashburnham in September by A. Archangelo. Larvae were found on hop tree (Ptelea) in Topsfield on 7/28/2013. Very late larvae were found on 10/18/2013 in a yard in Athol, possibly indicating a third flight. These larvae attempt to over-winter in chrysalis, to produce adults the following spring, however Giant Swallowtail is only marginally hardy in most parts of the state. For central New York (Ithaca), Finkbeiner et al. (2011) cite two reasons for the high larval mortality observed there in September: deterioration in host plant quality and high parasitism. In one case in Ashburnham, Massachusetts, in September 2011, of five caterpillars found on rue, one was eaten by a spider, three just stopped eating and died, and one prepared to pupate but was unsuccessful (A. Archangelo, masslep 10/11/2011). But if inside protection is provided, chrysalises can survive the winter. In Whately, both caterpillars sleeved outside and those raised inside pupated on 9/22/2011. These chrysalis' were successfully over-wintered in a refrigerator and basement and emerged the following May (Benner 2011). 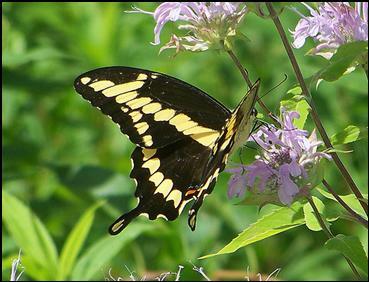 The Giant Swallowtail may be expected to increase in Massachusetts with climate warming. It is already on the increase in New York. Finkbeiner, Reed, Dirig and Losey (2011) documented the range expansion of Giant Swallowtail in New York, comparing 2001-2008 distribution maps with Shapiro's 1974 map to show substantial movement northward during that time. The research showed increases in sightings after years with no September frosts, suggesting occasional over-wintering, but did not demonstrate successful over-wintering at the latitude of Ithaca. Winter predation and parasitism of larvae was high, and the quality of host plants in fall was low. Still, some larvae were capable of withstanding multiple frosts to pupate normally into late October. Giant Swallowtail faces similar difficult conditions in over-wintering in Massachusetts, but some have been surviving in warmer winters in suitable locations. Climate warming will probably lead to an increase in Massachusetts of this southern-based species (Table 6), both through over-wintering and increased immigration each spring.